Education – anything but a game? Pro – What speaks for game-based learning? more engaging learning experiences for students. improving important skills, such as collaboration, teamwork, communication and/or public speaking, creativity, digital literacy and media making as well as critical thinking, problem solving, leadership and discovery, also risk assessment and risk taking. In an interview that I had to conduct as part of my H807 MAODE course from the Open University I spoke to the didactic and vice managing director from the VCRP about game-based learning, in particular about experimental role-play respectively role-playing simulation game (Plan-Rollenspiele). Very interesting and the VCRP offers not only role-playing simulation games, but also Online rally’s and Online Seminar’s. You might want to visit the website from the VCRP and have a look at the courses offered. However, my interview partner also took a critical stance. Games in education do not appeal everyone or the underlying circumstances simply do not correspond. Oblinger (2006) states for example that games and play influence our learning in early childhood, but game-based learning is not necessarily part of higher education (HE), although students in HE continue to play games. Here are some reasons that might give some explanations. Technology does not always lend itself to be game friendly. Will the game be played on a mobile device or on a computer (desktop or laptop)? it takes to much effort and time to design a game and not every educator is willing to take the immense effort needed designing a pedagogically well designed game. 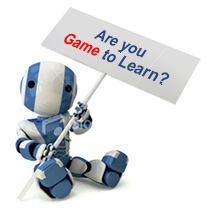 how to assess educational games and how to examine if students achieved the intended skills? Well, the list of advantages is pretty convincing, students who effortless learn for school as well as their future job . Will that be the future of education – anything but a game? That would be indeed a compelling vision, content learners who enjoy learning. According to the small survey conducted during the video conference last week only 50% who participated on the survey think that digital learning-games are an appropriate didactic mean, 43% are not sure about it, and about 7% decline games. However, only 24% of the participants deployed games in their teaching (see blog entry). I wasn’t able to participate on the last video conference but I would belong to the 50% who think that game-based learning can be a valuable educational mean. Yet, it cannot be the only mean/method to use in our teaching, but just one among many other methods. However, designing pedagogically sound games takes a lot of time and effort and the reluctance of educators is somehow understandable, especially when adequate training and provision of resources (e.g. staff allocated time to design games) are lacking. Helpful would be to apply a team-based approach, but that seems in some faculties still a foreign word, at least in my experience. Thus, it will be interesting to see if the NMC prognosis will become true or if there is just an initial hype that subside after a while. Jessica Trybus (2012) “Game-Based Learning: What it is, Why it Works, and Where it’s Going”, New Media Institute. Available from: http://www.newmedia.org/game-based-learning–what-it-is-why-it-works-and-where-its-going.html (accessed 29.05.2012). The article focus on the advantages of game-based learning. Mike Shumake (2012) Game-based Learning: A Paradigm Shifting Opportunity For Innovation, Getting smar blog. Available from: http://gettingsmart.com/blog/2012/03/game-based-learning-a-paradigm-shifting-opportunity-for-innovation/ (accessed 29.05.2012). Julie Brink (2012) “Game-Based Learning for the Corporate World”, Training blog. Available from: http://www.trainingmag.com/content/game-based-learning-corporate-world (accessed 29.05.2012). Oblinger, D. (2006) Games and Learning Educause Quaterly, [online] vol. 29, no. 3, 2006. Available from: http://www.educause.edu/EDUCAUSE+Quarterly/EDUCAUSEQuarterlyMagazineVolum/GamesandLearning/157406 (accessed 12 April 2010). A lot of times it’s challenging to get that “perfect balance” between user friendliness and visual appeal. I must say that you’ve done a fantastic job with this. find the majority of your post’s to be exactly I’m looking for. I wouldn’t mind writing a post or elaborating on a number of the subjects you write related to here. Again, awesome web log! It’s really a nice and helpful piece of info. I am happy that you shared this useful information with us. Please stay us informed like this. Thank you for sharing.